Researchers from the Institute of Photonic Sciences (ICFO) in Barcelona, Spain have developed a highly sensitive photodetector that uses graphene and quantum dots. 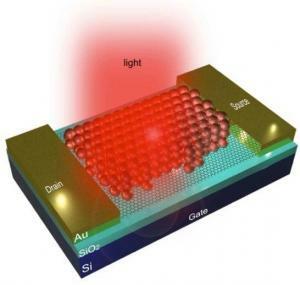 They say that the new device is a billion times more sensitive to light than previous graphene-based photodetectors because of the quantum dots. A photo-detector such as this can be used in light sensors, solar cells, infrared cameras and biomedical imaging. Graphene's external quantum efficiency (EQE) is low as it absorbs less than 3% of the light that falls on it. It is also quite difficult to actually extract the electrical current from the graphene. Adding the quantum dots on the graphene sheet helps both of these issues. The team now plans to scale up the detector to large-scale imaging arrays. The researchers also aim to improve their device even further so that it can detect single photons.